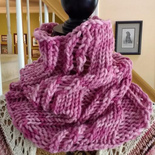 This is a lovely, bulky, quick knit cowl, perfect for getting a jump start on those holiday gifts. 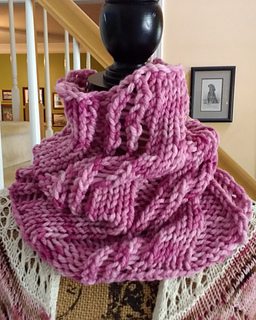 Ideal for a beginning knitter. Part of the Christmas in July KAL taking place on the Criminal Knits…for the Serial Knitter in all of us. Group - come join us! Please Note: As you knit the pattern will twist like the stripes on a candy cane - and yes, this is correct!